There’s been some discussion over whether this is definitely York. The background – industrial-looking – is perhaps not how we picture York. But these men worked at the gasworks on Foss Bank, and the buildings in the background look very much like the photos of those long-demolished buildings in Jane Hatcher’s book The Industrial Architecture of Yorkshire. Obviously they’re not dressed for work. They’re on their way to the FA Cup semi-final – York City v Newcastle – at the Hillsborough ground in Sheffield, which took place on Saturday 26 March 1955. 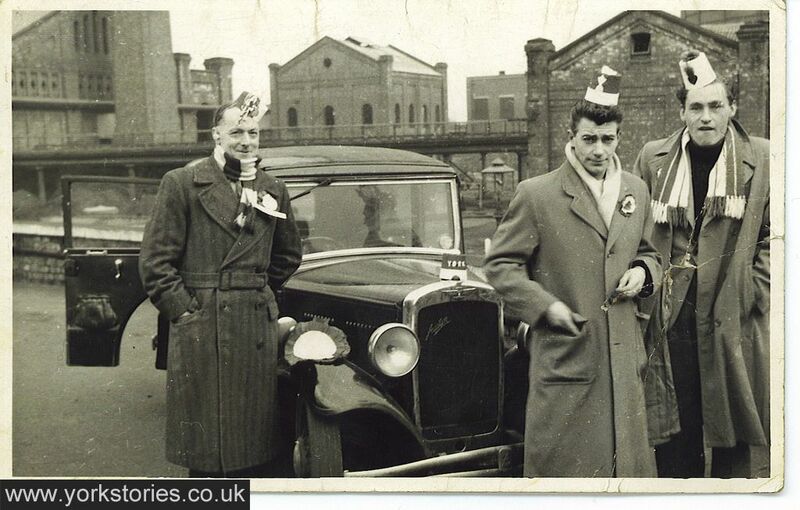 Hence the scarves and rosettes and the YORK badge on the front of the car. I’d like to be able to place this photo more exactly, so it can be pinned on historypin.com. Does anyone recognise which part of Foss Bank/Heworth Green/Layerthorpe this was taken from? It can be enlarged. The match they watched – on what looks like a sea of mud – is preserved by britishpathe.com, and viewable online. A report of the match on the official club website notes that it was ‘a gruelling cup tie played in terrible conditions’ and that York City had made history by becoming the first Third Division side to force a semi final replay. My father used to work at the gas works and as a child, this would have been 1952 or thereabout, I used to visit him quite a lot when he was at work. We lived at that time in Byland Avenue and so I used to pass the gas works for many years going into the city, and it does look as if the photo was taken there. I recognise the old retort house in the background. Just a passing comment about the soccer match, I remember the match was played mid week and was on the radio. At that time I attended Haxby Road Junior School and the whole school assembled in the hall to listen to the game being broadcast on the radio. The song that the York supporters used to sing was ” when the red red robbin goes bob bob bobbing along” as the team wore a red outfit. Thanks Jim. Do you think this was taken from the Heworth Green side or the Layerthorpe side? Or maybe the Foss bank part where Sainsbury’s now is? I know that the gasworks at one time covered areas on both sides of the Foss – apparently a railway line connected the sites? In the top right hand side of the picture there are a few rectangular blocks belonging to one of the gasometers. The question is – which one? In 1955 there were four gasometers situated on the Layerthorpe side. Two were telescoping, column guided variations; a shorter model which abutted the Foss bank and a slightly taller one which was co-located (diagonally) behind it. Each had an outer frame but the columns on the smaller model looked heavier than the slender and taller frame on its neighbour. The third gasometer was further along Layerthorpe: a fixed, non telescopic model, unframed but with a distinctive external stairwell. This waterless, piston model (the Klönne) was much higher than the others and painted an off white. It was set back from the road on Layerthorpe, behind a row of since demolished houses. Just beyond this was the spiral guided, telescopic model, obviously unframed. These gasometers were more dominant on the Layerthorpe side of the works with the retort house and peripheral buildings more centrally located and stretching out towards the Heworth Green side of the site. I have a rough idea of the location but if Jim (or anyone) could identify the gasometer in the picture that would certainly help in pinpointing it. Thank you David – I’m glad you’re looking at these as you’re seeing things I’ve completely missed. I didn’t even notice the gasometer looming there at the back, while I was concentrating so hard on the buildings in the foreground! After looking at maps on http://www.old-maps.co.uk, the location which seemed like it might fit didn’t seem quite logical. But I’ve since found some photos on http://www.imagineyork.co.uk, and noted your observations re the gasometer, and it seems to me that these confirm what I’d thought from the maps, that the photo was taken near the bend of Foss Bank (so Sainsbury’s and the outdoor store would be behind us). So Heworth Green is to the left of the photo, out of shot, and Layerthorpe to the right. The only reason this doesn’t seem quite right is that the corner of Foss Bank would be an odd place to take a photo. Clearly nowadays impossible, as it’s a busy road. But I guess in the 1950s the roads weren’t so full of cars, so perhaps it’s possible. – and the building shown with the arched opening and recessed detail looks like the one shown on our photo, again on the left of the image, next to the other building mentioned above. Again I’m assuming our photo shows the other end of it. Does this match the rough idea of location you mentioned David? Still not confident about the exact location/viewpoint though. Comments still welcome of course. Yes, that is where I have them too – just as the bend straightens out on the way up to Monk Bridge. The Foss Bank part of the gas works (now Sainsburys/Go Outdoors) is behind the person taking the photograph. The building with a chimney in front is definitely the one that stretched back towards Heworth Green. To the right of the photograph (out of sight) are the column guided gasometers on the Layerthorpe side. That small part of gasometer must therefore belong to the Klönne model, which usually appears quite white in photographs but not always, and its more central location and the pronounced rectangular pattern do match this. These regtangles could potentially have belonged to the spiral guided model, which, whilst only half the height of the Klönne and located behind it, still had a very wide footprint and could still be seen from Foss Bank. But the spiral guided model might not even have been built in 1955 so that would rule that out. I am wondering whether the group are stood on the Layerthorpe site itself, on an access road with a low boundary wall just behind them. So the river Foss would actually be a few steps in front of them. Today this area is grassed and has trees and benches running from the sides of the new builds to the river’s edge. That might place them where a willow tree currently stands in front of Milan House….all approximately of course. Thanks David, I feel reassured now about my placing on historypin.com, that it’s the right location and angle. I think you’re right though that they’re perhaps on an access road just across the Foss, on the site itself, as Foss Bank has railings there rather than a low wall. I’m glad I could attach it to Google’s Street View though, as it then shows how the modern flats have replaced the industrial buildings.